Sometimes you can’t be too choosy. This was not a great apple year for the wild apple “orchard” on our property. The few summer apples fell off the trees much earlier than seemed reasonable this year. The winter apples hung in there well enough that I was able to pick what seemed like enough to get the 6 gallons of cider I needed for the wine project I had planned. Yesterday was the day I’d set aside to press the cider. This job is one of my favorite on the farm. The press we own comes from a kit I bought when I was early in my undergraduate career in the 1970s. I built the thing by taking a night course in woodshop in the old Houghton High School building. The older guy running the class (probably in his 60s!) worked with me very well, and the resulting cider press has served us these many decades. I got the press down from the attic of the garage using a pulley and cleats I’ve developed over the years. Once on the ground, I placed it on my two-wheel cart, and moved it over to the front porch area of the house, where I assembled the equipment I’d need to press the apples. There are a couple of ways to go about this job. With a helper, I can just concentrate on turning the crank on the grinder, and holding my hand over the hopper so apples don’t leap out and onto the ground. My helper dips the apples out of the water-filled yellow wheelbarrow and tosses them into the hopper as the load goes down. This method gets a lot of apples ground up in a short time. I prefer yesterday’s method, if I have the luxury. The amount of apples was pretty small, and my reliable helper was at work, so yesterday’s solo operation was the only option. I say solo, but Franco stuck with me all the while, bringing me a stick to throw for him at regular intervals. 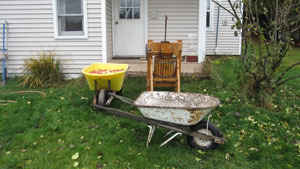 I would dip my hands into the wheelbarrow and grab a handful of apples. I’d plunge them under water, and examine them for any attached leaves, grass, or other grunge, which I’d remove. Then I’d move them into the hopper until it was full, at which time I’d turn the crank on the grinder until all the apples were ground up, and the pulp had fallen into the oak slat barrel below. Once the barrel was full, I’d shake things down a bit and even off the pile, then put the plug on top of the apple mash, and run the screw down until it meshed with the dimple on the plug. Then it was turn turn turn and watch the lovely clear stream of cider trickle, then gush, out of the hole and into the bowl below. When the bowl got full I’d replace it with a spare, and empty the full bowl into the carboy I had standing by on the porch. I got 4 full barrels of apple mash this year, which netted me about 7 gallons of lovely cider. Even though the apples were some of the rattiest I’d seen in a long time, the cider was delicious. I don’t know of a better taste than a cold cup of newly pressed cider that was generated by my own efforts. The cider sat in the carboys overnight. 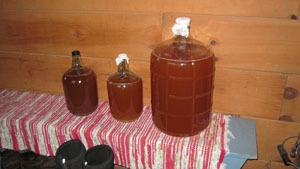 In the morning, I followed the recipe for the cider wine I’ve made on several other occasions. The first day everything is added to the cider including 2 campden tablets per gallon of cider. These kill off any yeast that might have hitched a ride on the apples. 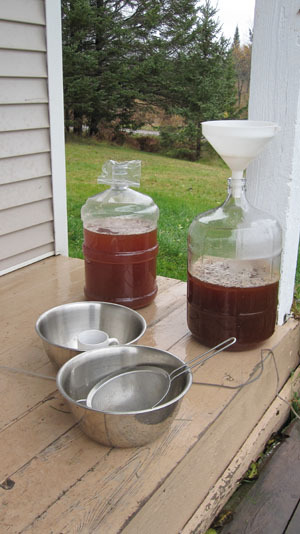 Tomorrow morning, I’ll add the purchased wine yeast to the yeast-free cider, and watch the fermentation commence. It will start slow, but once the yeast gets going on that sweet cider, the bubbles will really fly. In no time at all, I’ll be hustling around for every wine bottle I can find so I can fill, cork, and start the two-year mellowing process in our wine cellar. I’m not much of a wine drinker myself, but I have learned to sip the finished product, and am slowly learning to tell whether the batch was a good one or not. I’ve found that the same recipe can yield a vastly different product, and that the finished product is always satisfying to behold and sample. This entry was posted on Thursday, October 25th, 2012 at 11:15 am and is filed under Uncategorized. You can follow any responses to this entry through the RSS 2.0 feed. You can leave a response, or trackback from your own site. Hey Erin. It was a good day. I remember the bottles of lovely liquid lining up. It sure goes a lot faster when there are lots of people working on it. Happy drinking!